I should have played the Ohio Lottery. We bought some Mudhens tickets this year because my family wanted to see the Tigers exhibition and because we are impulsive. The Mudhens won the game 5-1. I didn’t keep score so I only remember a few specific impressions and events. Wilk looked good an had a lot of strike outs. The Indianpolis pitchers walked a lot of Mudhens. Ciriaco hit a Cabrera-like line drive home run. He also had a pre-knee-surgery-Inge-like stop on a hard hit ball to third. The title comes from three specific events though. 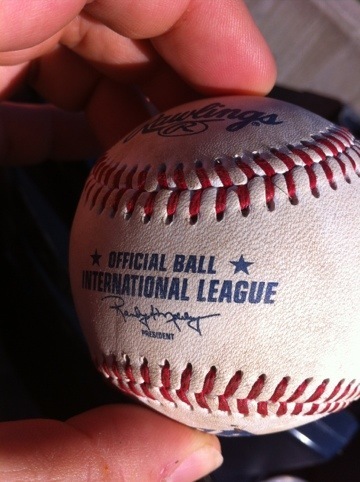 I got my first real, in-play game-used foul ball. (Well my youngest daughter actually has the ball.) The ball deflected off a guy a few seats over, and landed in the seat in front of me, which had been vacated by someone with the good sense to avoid line drives. I don’t have the problem of excessive good sense in these circumstances. Also, in the 8th the Indians pitcher, Bryan Morris, struck out 4 Mudhens: Berry, Young, Patterson and Strieby. It was pretty exciting to see 4 strike outs in an inning in a professional baseball game in person. A check of Wikipedia says this has happened only 60 times in Major League Baseball. I’m not sure if it would be more frequent in the International League because of wilder pitchers, or less frequent because of fewer knuckle balls and split fingered pitches. The announced attendance at the game was 13,277. About a third of those people were invisible. Also, the rarest thing was that I saw a Mudhen win. I am a mega-jinx on that team. Yuenling has made its way to Fifth-Third this year. They had a few stands with good selections of other beers as well.